The EPA has issued a final report to Congress to address data center energy consumption, improve facility energy efficiency and establish benchmarks. The federal Environmental Protection Agency (EPA) has issued a final report to Congress detailing the increasing power consumption of servers and data centers and how government and the industry can alleviate the problem. The EPA data center report, which resulted from a bill that Congress passed last year, focuses on three issues: the problem of rising energy costs in data centers, how data centers can minimize energy consumption, and how the EPA and the industry can develop energy efficiency benchmarks for servers and data centers. "The most important thing to start off with is that this is not a technology problem at all," said Andrew Fanara, the head of the EPA Energy Star product development team that wrote the 133-page report. "It's really a people problem in many respects. It's a function of [what] any organization needs to do good planning and implementation of best practices that currently exist." It's really a people problem in many respects. In 2005 the EPA started taking an interest in data center energy issues after data center operators presented their power, cooling and space issues to the agency, Fanara said. The agency then built on research on data center power consumption by Jonathan Koomey at the Lawrence Berkeley National Laboratory and, in accordance with the congressional bill, began exploring what could be done to alleviate data center energy consumption problems. It leaned on knowledge bases within the industry, including the Berkeley Lab in Berkeley, Calif., and the Santa Fe, N.M.-based Uptime Institute Inc. for some best practices already in existence, and the EPA has suggested other avenues for improvement. In 2006, U.S. data centers consumed an estimated 61 billion kilowatt-hours (kWh) of energy, which accounted for about 1.5% of the total electricity consumed in the U.S. that year. The total cost of that energy consumption was $4.5 billion, which is more than the electricity consumed by all color televisions in the country and is equivalent to the electricity consumption of about 5.8 million average U.S. households. Data centers' power and cooling infrastructure accounts for about half of that electricity consumption; IT equipment accounts for the other half. If the status quo continues, by 2011, data centers will consume 100 billion kWh of energy, at a total annual cost of $7.4 billion. Those levels of power consumption would also necessitate the construction of 10 additional power plants. In the report, the EPA spelled out three different energy-efficient rating systems that data centers and the industry can use as guidelines: "improved," "best practice" and "state of the art." The improved system includes doing low- or no-cost activities, such as shutting down servers that are not in use but that still draw power, using power management features on servers, and improving airflow management in the facility. The best-practice system includes adopting "energy efficient" servers, buying more efficient uninterruptible power supplies, and adopting free cooling, such as by using airside economizers. The state-of-the-art system includes the aggressive consolidation of servers and storage, enabling advanced power management features throughout the data center, and using direct liquid cooling. 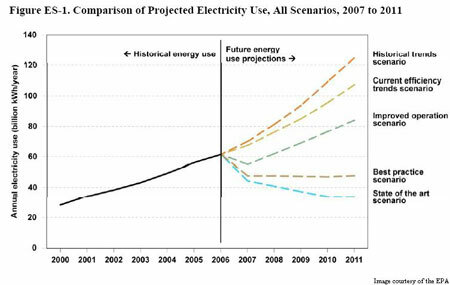 While continuation of the status quo would result in data centers' consumption of an estimated 100 billion kWh by 2011, the improved system would bring the number down to about 85 billion kWh; the best-practice system to about 50 billion kWh; and state-of-the-art system to about 35 billion kWh, according to a chart in the executive summary of the EPA report, which is also featured below. The report, however, is just the beginning of the work, said Fanara. Now the EPA, the federal Department of Energy and the data center industry will go to work on implementing the report's recommendations. Fanara said the EPA will host a series of conference calls and meetings to talk about what a data center energy metric should look like. The industry is already in the throes of discussion about how this metric would work. It will be called the "data center efficiency metric" or something similar and will rely on two variables: the amount of power going into a data center facility and how much of that power reaches a data center's IT equipment. There have also been discussions about how the efficiency number would be expressed. Should it be represented as a percentage between 0% and 100% (i.e., "My data center is 63% efficient"), or should it be a variable that improves as it approaches 1? "We'll then need to begin to collect data from data centers to get the best picture possible," Fanara said. "I think we want to collect that data to begin to understand what the trends are and what the opportunities are. If we have a good representative sample of data centers, then it might be the case that Energy Star will step forward and do an Energy Star for entire data centers, just like we do for hotels and schools and other buildings." Ken Brill, the executive director at Uptime, said that it's most important to emphasize to company executives that being energy efficient can save them hundreds of thousands of dollars. Brill, author of the recent report "The Invisible Crisis in the Data Center: The Economic Meltdown of Moore's Law," said that pointing out fiscal savings will accomplish data center efficiency from the top down rather than having IT guys at the bottom make suggestions to executives that go unheeded. "The biggest problem is getting people to pay attention," he said. "Trying to go from the bottom up isn't working. It's not getting traction. The way we get traction is if the CIO and CFO realize how much money this could save."